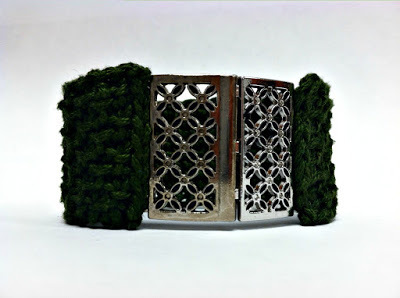 Free Pattern - Tunisian Cuff with Video Tutorial - love. life. yarn. I have really been inspired by jewelry findings lately and loved this slide clasp I found at Joann. It took me a long time to think of just the right project for it and finally settled on a Tunisian seed stitch bracelet. I like the look of Tunisian crochet but don’t do it often because I don’t want to work with the long hooks required for larger projects. Since this project is only 10 stitches wide I was easily able to crochet it with a regular hook – in fact I made it on my favorite hooks that are mostly handle! I made it green because I had a nice crisp cotton DK yarn and because the slide clasp reminded me of flowers or four leaf clovers. Plus, it’s March so that means St. Patrick’s Day is coming up! What better way to wear your green than with a green piece of jewelry you made yourself? If you’ve never tried Tunisian crochet before this is a great project to give you some practice with two of the most basic stitches: Tunisian Simple Stitch (Tss) and Tunisian Purl Stitch (Tps). There are no special hooks required since it’s so small and any DK yarn should work. The small hook gives it a nice firm texture so it won’t bend or stretch out of shape. Now that I’ve completed this, I’m thinking of working with Tunisian crochet more often. It has a very nice look! Return row: yo, draw through one loop (forms the edge), *yo, draw through 2 loops; repeat from * until one loop remains on hook. Don’t turn. This loop is the first st of the next row. Foundation Row (forward half): Working into loops on under side of ch, insert hook into 2nd ch from hook, yo, draw up loop and leave on hook. *Insert hook into next ch, yo, draw up loop and leave on hook; rep from * to end – 10 ch on hook. Row 1 (return half): Work return row. Row 2 (forward half): Skip first st, *Tps, Tss; rep from * to last st, Tss in last st.
Row 2 (return half): Work return row. Repeat rows 1-2 until piece measures 6″ from beginning. Fasten off. Sew slide clasp to ends. Check out my first tutorial video! The Tunisian Cuff Tutorial will walk you through the first few rows of this project. Looks so nice and with the video so easy to do! something different!